As Loretta and I have described before (see here and here), little boys in the past were dressed much like their sisters, in loose-fitting frock-style garments that made diaper changes easy. Reaching the age to be "breeched" and shifting to wearing miniature versions of adult male clothing was a major milestone for 18th c. boys. In the late 18th c., however, there was a general relaxing of children's clothing. Instead of stiff little waistcoats and breeches, boys wore a practical two-piece garment that made the transition to adult clothes a bit easier. This was called a "skeleton suit," a jacket and trousers that buttoned together at the waist for the sake of neatness and ease. The name came from the clean lines and snug fit of the suit, which gave the wearer a narrow silhouette - ostensibly like a bare-bones skeleton. Skeleton suits were often worn with a shirt with a soft, ruffled collar, and were usually made of plain wool or linen, like this one from the collection of Colonial Williamsburg. 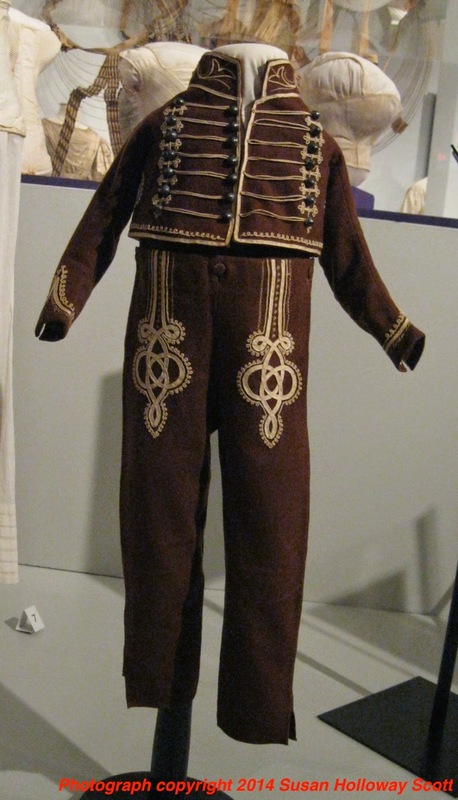 This skeleton suit is part of an outstanding exhibition, Profiles: Chester County Clothing from the 1800s, currently on display at the Chester County Historical Society, West Chester, PA, and running through August 30. I highly recommend it if you're in the Philadelphia-Wilmington area (or visiting nearby Winterthur Museum to see the costumes from Downton Abbey.) This past weekend, I attended a symposium on historic clothing in conjunction with the exhibition; look for more blogs about what I heard and saw. Left: Skeleton Suit, 1800-1830. Brown wool, cream silk embroidery. Collection of the Chester County Historical Society. Photograph copyright 2014 Susan Holloway Scott. 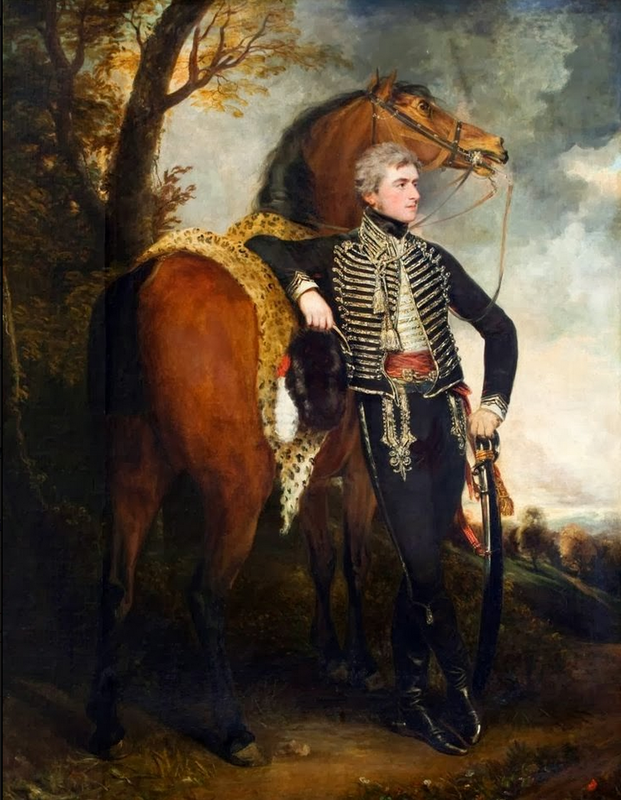 Right: Field Marshall Henry William Paget, 1st Marquess of Anglesey, by John Hoppner & Sawrey Gilpin, 1798. National Trust Collection, Plas Newydd, Anglesey. The little boy suits are charming but I shudder thinking about putting a boy in one before he was six. The style of having the oants buttoned to the bodice continued into the twentieth century-- I have a picture of my husband at 4 or 5 wearing a white suit with tp and bottom buttoned together . I even put it ion my own son once. It is just too hard to get the buttons undone in a hurry when the boy suddenly realizes he has to use the toilet. Of course, there would likely be several servants-- one might be the boy's own attendant in any house where the sons could be dressed in such a manner. I do like the looks of such suits though. By chance do you have a picture of the back? I'm seriously considering recreating it in a different colorway and I'm wondering if the back of the jacket is plain, or if it has crazy braid on it as well. Howlgirl - Alas, I don't have a photo of the back. As you can see, there was another display case directly behind the suit, making a photo impossible. However, if I go to the exhibition again (which I proably will, since I live nearby) I'll be sure to peer around the case to the back view for you.